"The Medical Commission holds an annual conference every year for both practitioners and the public. in 2018 our conference was centered around the future of patient engagement. 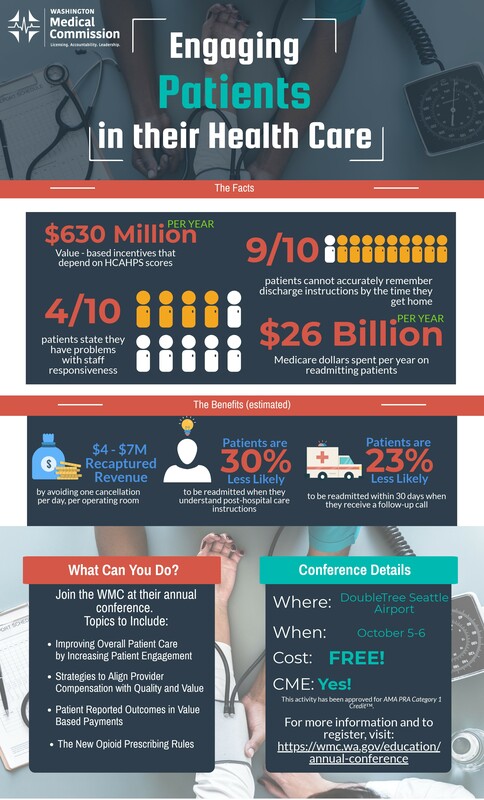 This infographic was used as an advertisement for the conference and an educational tool to demonstrate the value of engaging patients." Thank you to all other participants in WSPHA's infographic contest! See all other submissions below. "Outbreak Responders uses the narrative power and visual interest of comics to tell the story of communicable disease response in a local health department. The story is a snapshot of the daily work of communicable disease investigation. Through the story, we aim to convey the high caliber of the public health workforce, the complexity and critical nature of the work we do, the dedication and passion of public health workers, and the constraints that we work under when resources are stretched thinly. 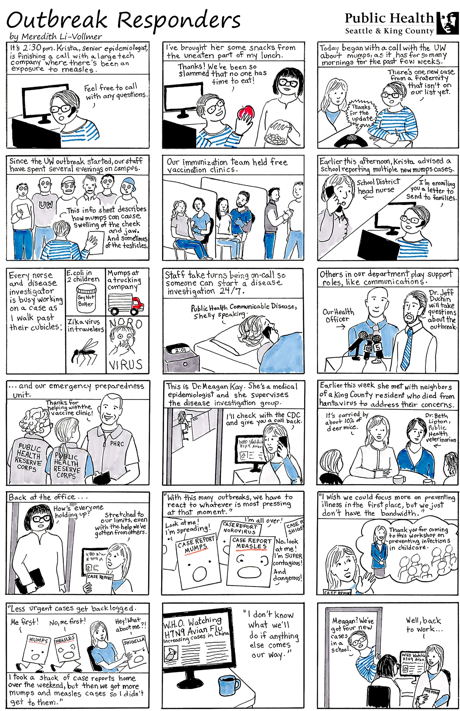 We chose to tell this as a comic strip to make it accessible and easy to read, allowing the visuals to convey much of the message related to the breadth and urgency of public health services." 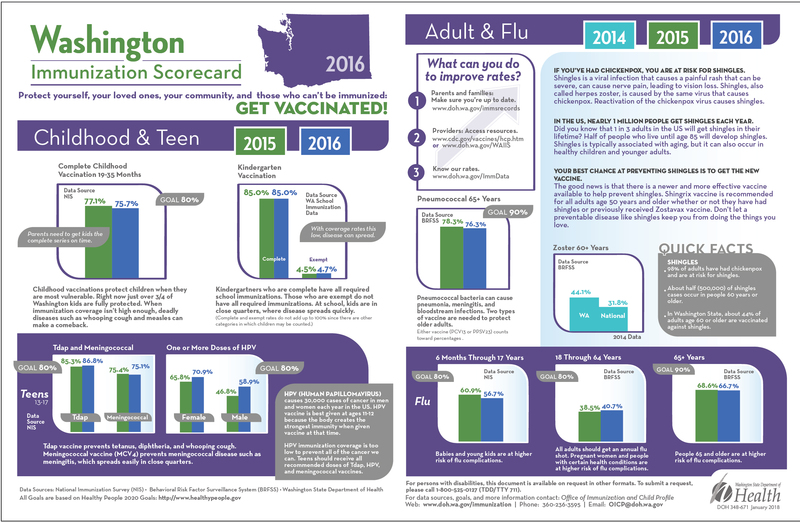 "The Washington Immunization Scorecard provides a quick glance at Washington’s immunization coverage for all ages. It is intended to inform health care providers, policy makers, partners and the public about our progress toward our immunization goals. The Scorecard features rates for key childhood, adolescent, and adult immunizations. It also showcases some current issues in immunization and guides providers on improving their vaccination rates." "Investing in public health is essential. 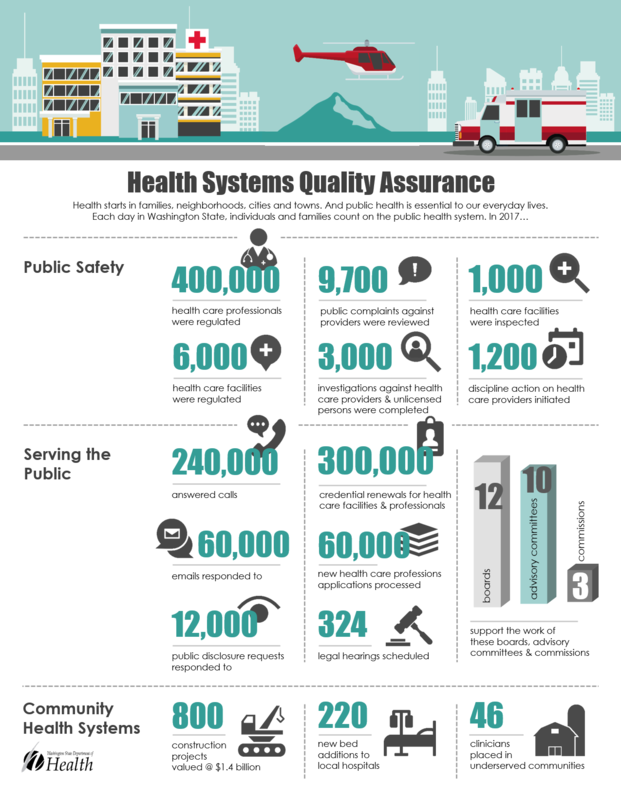 This infographic shows the City of Tacoma’s current financial investment in local public health. It highlights Tacoma-Pierce County Health Department programs that support the City’s priority areas of public safety and homelessness." "The Child Profile Health Promotion System is our state's centralized immunization and well-child visit reminder system. The Department of Health uses the system to send health and safety information to all families in our state with kids aged birth to six years in English and Spanish. The information in the mailings prepares parents for their child's next well-child visit, including which immunizations may be due, as well as other health and safety topics based on the child's age. The Child Profile Health Promotion System also has two Facebook pages (one in English and one in Spanish) and posts similar information for families there. The pages are called Watch Me Grow in Washington (https://www.facebook.com/WatchMeGrowWA/) and Mirame Crecer en Washington (https://www.facebook.com/MirameCrecerWA/). One of the materials that goes out in the mailings comes from the Department of Children, Youth, and Families and covers the important issue of postpartum depression. This infographic was created for the Watch Me Grow in Washington Facebook pages to help spread the word about postpartum depression and to make sure women know they're not alone and how to find resources." "The attached example is a part of series of infographics which reflect internal and external work and services provided by the state Department of Health." 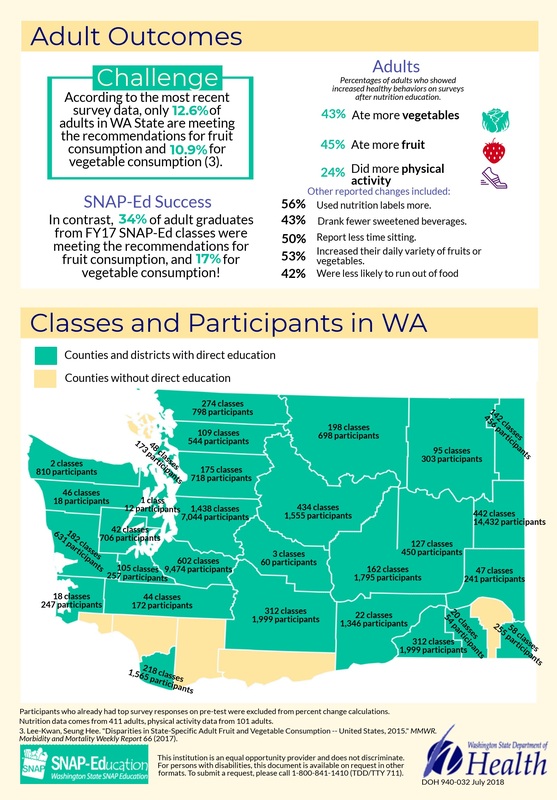 "This infographic gives an overview of Supplemental Nutrition Assistance Program Education (SNAP-Ed) outcomes for Federal Fiscal Year 2017. 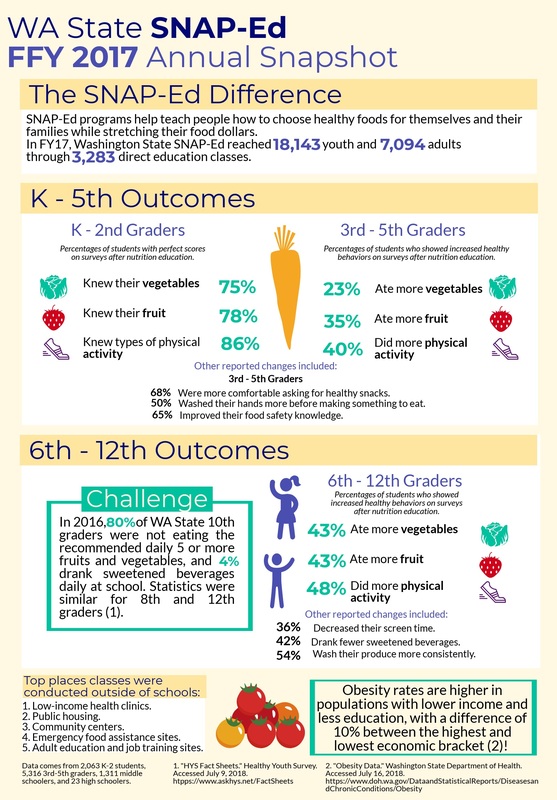 The snapshot highlights behavior and knowledge changes around nutrition and physical activity by participants in direct education classes, as well as the reach of SNAP-Ed activities."